That's entertainment, not! How Machiavellian can you make it? Kate and I kept our sailboat in Midland Ontario, and cruised Georgian Bay for many years. Our entertainment system consisted of a good battery powered boom box, and a 5" black and white TV. Since most of the places we gunk holed in, had no television reception at all, the TV was only used occasionally to provide me with a news fix when we were in a larger port. The boom box was used all of the time, you gotta have tunes, and these things always worked. Entertainment systems on boats are becoming horrifically complex, and are some of the most technically challenging jobs I do. Most installations I deal with have a few things in common. The first is the lack of any wiring diagrams. If you've ever stared at the back of your new television, there must be an almost infinite number of ways to connect systems together, and no two boats are ever wired the same. This is already making my head hurt. The second thing, is access is alway difficult. Unlike your system at home, you can't just pull the cabinet away from the wall, sit behind it, and sort out the wiring. Why, it's a boat of course, and easy access is against all of the rules. The last common element, is every TV/Sound system installer's label maker is broken, why else would all of this wiring be unlabeled? So how complex can it get? The picture below is an example. This is a sixty foot late model trawler. What you're looking at on the floor, is a two terabyte Alienware Hanger 18 Vista based media server. Having Bill Gate's operating systems on a boat always makes me nervous. In the cabinet on top, is a powered HDMI splitter. Below it is a JVC Hybrid amp/source selector, and below that is a AV back up UPS unit. What you can't see, is the audio encoder that talks via ethernet to the Colorado Vnet music server that is located in the pilothouse. Add to this touch panel displays, Ipod interfaces, two large external USB hard drives, surround sound system, vessel wide, zoned speaker system for music, keyboards, mice, dongles, and a drawer full of remote controls, and OMG, next to no documentation. On top of this, the system was installed by a home theater company, that was located at least a thousand miles from the nearest ocean. Oh yes, another installer later modified the system, to the point where almost nothing worked. In the mix is the fact that the home theater installers apparently were not aware of the shore CATV cable system in the boat, because it was never connected to anything, and the same for the SeaTel system. I think they were just mysteries to the installers, and no TV's for you, only monitors. The sound has to be routed through the music server, and then to speakers via the touch screen displays. It's going to be all okay. After some e-mailed photos, along with some long discussions with the very helpful original installers about how the thing worked, and some sleepless nights pondering the issues, almost all the problems are solved. The few minor ones left are now solvable. The monitor in the main salon was changed out for a TV. The CATV system was located, connected, and the vessel is now plugged in to Comcast cable at the dock. For the first time, since the boat was built, the owner has been able to watch TV on the boat. None of the equipment fit into the cabinet, and I modified it so it now does, and the door can now be reinstalled. A fan system has been ordered, to cool the cabinet because the Alienware gear gets hot enough to cook eggs on. All of the wiring is being labeled, and I am preparing installer notes to help the next poor soul who has to deal with this eclectic collection of advanced technology. The more you want the system to do, the more complex the system becomes to install, and operate. Bob wants high def TV in the cockpit so he can watch ESPN. Okay this is fine, but Carol wants to watch Oprah in the salon at the same time. Alright I can do this, but it's another receiver, a new remote, and more wiring. The kids want MTV at the same time in their cabin, sigh, another receiver, and remote, and more wiring. Bob also wants to plug into the dock cable system, and wants on air TV reception. Some of the sets have digital tuners on the boat, some don't. Now a digital converter has to be added to the boat, along with another remote, but alas this remote is an IR remote, and a way has to be found to convert the signal to RF. Carol wants all of the receivers and black boxes to be out of sight, so things are installed in places like closets, and under beds. AC power now has to be pulled to each location, and outlets installed. Did I mention the KVH system, and the three Blueray DVD players? 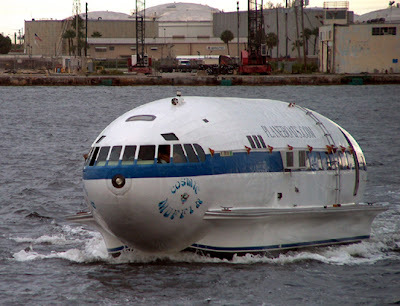 Now Bob says he wants it all to run on one remote, argh, (yes it is a real word) it's a boat, not a movie theater! I'm sure you get the point. It's hard enough to do this at your home, but it can be extremely difficult to do this on a boat. Last year I did a system like this, and pulled over a thousand feet of wiring through a sixty foot boat. And now you want it to work? The documentation to explain how to use all of these systems, in their various manifestations becomes substantial. Everything is now installed, and working properly, the boat leaves port, and that night I get a call. Bob can't get the dock cable to work. Now Bob, did you push the button marked "Shore", and has the TV's input been changed from "HDMI" to "TV"? Did you auto program channels from the local marina cable feed? And so it goes on. Bob and Carol use the boat about seven times a year, only in the winter, and forget everything they knew when they arrive next winter. The following is a set of directions I prepared for a 44' boat that has several users. It is a very simple system, with a KVH M3, shore cable input, and a on air digital converter, but without directions to refer to, it wouldn't be usable for them. There are four TV's, and one of the Raymarine E-120's displays is being used. There are some additional notes at the end. Press "SAT" on the push button box on top of the stack. Make sure the KVH receiver is on. Green, Green, Green/Flashing Green. Flashing Green on the rightmost LED means it’s searching for signal, solid green means it has acquired the satellite. Use the Direct TV remote to change channels, if it doesn’t, press the SAT button on the Direct TV remote. If the KVH receiver is showing Green, Amber, Amber, it means it's asleep. Press "SAT", then "On" on the Direct TV remote. Press "ANT" on the push button box on top of the stack. Using the Apex black remote control, make sure the power light on the receiver is turned on, and is green, not red. Use the Apex remote’s "On" button to change the light to green if needed. Use the Apex remote control to change channels, and the individual TV’s remote control for volume control. For the Raymarine display, volume is controlled by the Clarion stereo system. Press "CBL" on the push button box on top of the stack, and plug in coax cable to the dock.. Dealing with the flying saucer in the cabinet. If the black Apex remote is not working, the battery needs to be changed. Open the battery compartment of the Apex remote, and remove the first battery. This is a battery, and a RF transmitter. The battery will slide out of the battery case/transmitter. It is about half of the size of a regular AAA battery. So far so good. Now go to the flying saucer in the cabinet, and open the bottom of it, to expose the battery compartment (there is enough loose wiring to do this) Take out the charged battery, and replace it with the battery needing charging. Take the fresh battery, insert it into the battery/transmitter case, and put it back into the remote control. Go to the Raymaine display, and set it to Video 1. You should see at a minimum the Direct TV logo. If it is not there, make sure you have Green, Green, Green LEDs on the Direct TV/KVH receiver. If not use the Direct TV remote to turn it on. If there are no LED’s, showing, turn on the receiver by pushing the "On" button in the lower left hand corner of the box. "No Signal" on the Raymarine video page means something is not turned on. Double check that the TV’s are on the proper channels. "4" for Direct TV/SAT, "3" for on air reception. Make sure the push button box is correctly set. CBL for dockside, ANT for on air, and SAT for KVH/Direct TV. The stereo must be on 88.3 FM for the sound to work with the system. This is preset button "1" on the stereo, if someone hasn’t changed it. No chart detail on the Raymarine chartplotter, go to the chart page, press "Presentation", and turn "Declutter" off. If your Raymarine system beeps at you every few seconds, push and hold the WPTS/MOB button until is stops. You held the button down to long and activated the MOB alert. 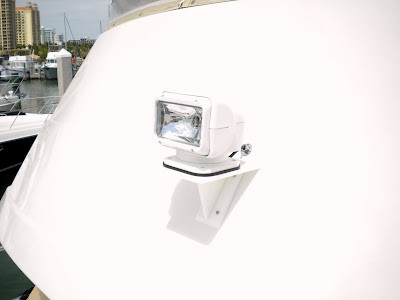 Raymarine to dark to see? Press the red power button once, and then press the 4th soft key button at the bottom, going from left to right. This puts the unit back in day mode. This is a very simple system, you should see the directions for a complex one! So boys, and girls, remember, on a boat, simpler is always better, so don't bend over backwards to make it complicated, or you will never learn how to use it. By the way, instead of TV, there are also books, watching the sunset from the cockpit with a glass of wine, and some cheese and crackers, and gasp, even conversation. Oops, Kate wants to talk about feelings, isn't that basketball game on? "Oh John, it's getting dark, there is no place to mount the light, and I'm so afraid of Zombies." Coming up next on the "Shinning Light." The title is a little melodramatic, but there was no other place to put a spotlight.This is a nice Mainship trawler, with a soft top over the fly bridge. There is a radar mast aft, with no room because there is a Raymarine HD radar on it. The bow pulpit also has no room for a spot, and I am not a fan of putting spots on the bow anyway. The constant salt spray shortens their life, and I often see lights up there that only go up or down, or left or right, but not both. The decision was made to mount the light on the cowling of the fly bridge. The base, and gusset are made of 1/2" white acrylic, and the platform is 3/8" acrylic, and the assembly was fabricated by Delcraft Acrylics. delcraftacrylics.com/ The platform is "in situ" attached to the gusset with #10 SS screws. It's hard to see in the picture, but the back of the platform sits on top of a small ledge that runs around the cowling. The wiring passes into the console through a small SS bulkhead fitting. The assembly looks like it came with the boat. It just goes to show, there is always a way, and now Marsha can see the Zombies while they dock in the dark. A Searay before and after. Beauty is skin deep. This was a satisfying project. In the panel above was a dead B&G Quad VHF, GPS, and a Lowrance X75 depth sounder. Under the panel, was the VHF radio encased in a 1/2" black starboard wedge structure, that was made of pieces that looked like they were chewed out by beavers. This was also a lousy location for the radio. You couldn't see the VHF's screen from the helm, with out cricking your neck. The first operation was to remove the non-functioning gear stat, leaving a bunch of holes in the dash. A new overlay panel was made, matching the the width of the panel above Another panel was was made to cover the hole left by the VHF radio. The boat had a nice Furuno Navnet system with radar, but it was not interfaced to the surviving B&G autopilot. The remaining B&G gear (Pilot and Depth) was reconfigured, and the Furuno Navnet system was interfaced to the auto pilot. An Ipod and Sirius cradle interfaces were also added to the vessel (See the below article). The vessel now looks much better, and has lost some weight. The ACR controls were remounted in the new panel, along with the VHF radio. As a last note, never hire beavers to work on your boat. They work hard, and cheaply, but everything looks a bit gnawed on. O Aux, O Aux, wherefore art thou Aux? Creating a radio auxiliary input for your stereo, when there isn't one. A DYI project. The giddy bob above is one of my favorite problem solvers. The desired source of music for many owners is their Ipod, or Sirius and XM receivers. The problem is integrating them into an existing stereo system of a boat. Many vessel's stereos do not have an available auxiliary input available to use, and hence the Scosche solution (Don't ask me how to pronounce it!). This device is an FM modulator, and takes an audio input, and squirts the audio source directly into the radio via the antenna wire. This works much better than the wireless versions, and is much less prone to electrical interference. The little gray box can be set to several lower FM frequencies, and the sound fidelity is excellent. 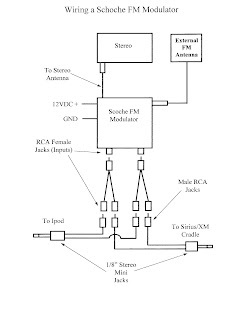 In this case, the wiring diagram below (click it for a better printable view) shows a satellite radio car kit system, and an Ipod both connected to the Scosche input. The caveat here is you can't play them both at the same time. I take that back, you can, but you will just hear both audio sources at the same time, and I suspect that this would be annoying, at least to me. But maybe "Mashers" could give it a try, and let me know what it sounds like. If your just doing a single device, you can use the little Ipod interface plug that comes with the unit. The Scosche modulator can get its power from the radio's power circuit (red wire, not yellow). It uses very little current. You unplug the radio's antenna wire, and plug it into the Schoche's female antenna connector. You then take the Scosche's male antenna connector, and plug it into the radio. Yep, the antenna still works as well as it ever did before. Now what's left is to attach the new inputs. in the drawing, I show a splitter going into each L/R input. This is a single male RCA end, with two RCA females at the other end. This allows you to hook up two inputs to the Scosche box. Connected to the two pigtails are two cables, each with two RCA male connectors at one end, and an 1/8" mini jack at the other end, that allows connection to the Ipod, and or a Siruis/XM cradle. Pick a frequency on the box, set the radio to that frequency, plug in the Ipod, and you have tunes. For satellite radio, I often use a car kit that allows owners to move the units from the car, to the boat. These car kits come with a non-marine antenna, 12VDC plug, cradle, and a cassette tape adapter. They sell for about $30.00. I throw away the cassette adapter thingy. I can usually find a hidden place inside to mount the antenna, and I glue it down with silcone, or similar non-3M 5200 goo. I purchase a 12VDC receptacle, and plug in the power adapter, and give it a couple of wraps with tape to keep it from shaking out. This can also be tied to the radio's power source (red wire, not yellow). A little note about the car style plugs for Ipods, and car kits. They transform the 12VDC voltage to a lower level. If you cut the plug off, and wire it directly to 12VDC, you will cook your 4 gigabyte Ipod. I thought doing a Goofus and Gallant themed piece was humorous, and clever, but maybe it was just a little too obscure. So as a brief footnote to the story, Goofus and Gallant was written Garry Cleveland Myers and drawn by Anni Matsick. It first appeared in 1948 in Highlights magazine. As a kid I read it whenever I was at my pediatrician's office waiting for a shot, or some other terror to occur. The short story of these two panel comics is Goofus is a jerk, and Gallant is a nice, but goody, goody two shoes kid (they are brothers you know). The story is alway the same, and goes something like, "Goofus yells at his wife to haul up the anchor." "Gallant nicely asks his wife to take the helm while he hauls up the anchor." All mothers wanted a Gallant, but there is a little Goofus in all of us. I will try to be not so clever in the future, maybe. You can zoom in with your browser to get a closer view of the strip. I have been on several boats this week, and when I checked the chartplotters, I noticed that the time had not been changed since we sprang forward, so this is a gentle reminder to do so. We all set our microwaves, and clock radios to the correct time, and this needs to be done to many brands of navigation devices. Not having the right time offset throws off the tides, and current data, and ETA's by an hour, and this can cause problems, especially if you boat in a tide sensitive environment. This notably affects Furuno and Raymarine, but many other brands need the time offset manually adjusted. So the current offset for "Eastern Standard Time" from GMT, UTC, and Zulu time (all names for the same thing) is now -4 hours. Central time is -5 hours, Mountain time is -6 hours, and Pacific time is -7 hours. Not to leave Canada out, Atlantic time is -3 hours. So the next time you're on your boat, check the current time on your chartplotter. If the time is not correct, change it, and life will be better, or at least more accurate. I will remind you again in the fall to go aft on the clocks..
Mastercrafting, a temporary Garmin install. This high tech vessel is purpose designed for skiing and wake boarding. 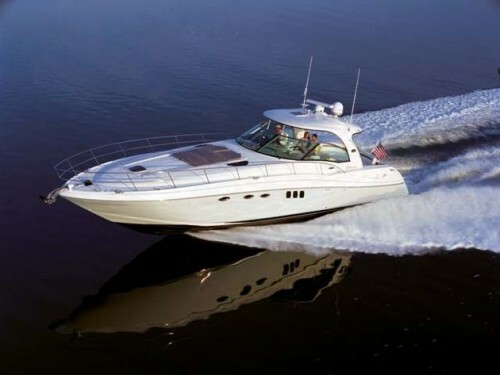 Built by Mastercraft, it has a single screw, and is the NASCAR of boats. By this I mean it is designed to drive fast, and to turn left, or right depending on the driver's sense of Coriolis forces. The boat lives on a lake in the north, and given the fact the water is somewhat hard this time of year, and it's spring break, the boat is now in Sarasota with a crew of students. Dad prudently believes there should be a chartplotter on board, and commissions me to temporarily install a Garmin 540S system on board. By temporary, the intention is to not put holes in the boat to secure the device, and to quickly be able to remove it. I have only watched these boats from afar, and this is the first time I have had the opportunity to look at one closely. It is a remarkable little vessel with a 400hp engine, and a single straight shaft screw. That switch panel on the lower right (click pic) above the speaker controls the ballast tanks in the boat. These tanks adjust the weight balance of the boat depending on its tow load, and as I was told by Michael, they are really used to create a larger wake, which makes for larger jumps. The instrument panel is well laid out, but like many builders of boats of this size, there is no accommodation for a chartplotter. I will give the builders a pass on this, because most, but not all end up on lakes, and do fixed circuits. There is also a large rear view mirror, which I this is a good idea for any boat. The Sonic Thrusters seen below add some additional warp speed to the boat when activated, and I'm sure there is a Klingon cloaking device on board this space age boat, I just could't find it. In the end, the miracle material Velcro was the solution. The base of the Garmin unit was basically flat, and provided good holding, with my caveat of no getting air time with the boat. I brought the power, and transducer cords down the front of the black dash, and tied them up underneath. I glued down the transom mount transducer forward of the V drive Merc engine, and tapped power from the accessory outlet. The unit will come out of the boat in a couple of minutes, with the exception of the transducer which is now a permanent fixture in the engine room. the Velcro will lift off, and some mineral spirits will clean off the residue. A little note here, I put some clear packing tape down on the vinyl, and put the velco on top of it. The tape will lift off without taking the vinyl skin with it. As I am oft to mention, I think every boat should have a nav device, and since you can get an inland lakes chip, maybe it should given a permanent home. Sometimes I just start a story, without knowing exactly where it is going to take me. More often than not, they end up in my Museum of Shattered Dream's vast collection. We will just have to see what path this one wends down. The vessel above proves that there is the right boat for everyone, out there some place. Bob sells his company in Tucson, and with his wife Carol, they buy a canal home in Florida. The big truck comes with their stuff, and they get settled in. Sitting out by the pool, with an adult beverage, Bob looks down the canal at all of the neighbors boats. The house across the canal has a Boston Whaler Outrage, the young couple to their left have a long sleek fast colorful powerboat, and the couple to the right have a 52' Searay sedan bridge. Bob stares at his empty dock and thinks, all the neighbors have boats, we should have a boat also, or we won't fit in. So he turns to Carol, and says "we should buy a boat." Carols, says, "but dear, you don't know anything about boats. ", to which Bob states, "whats to know, its like driving a car." On the next canal over, Ted and Alice have just moved in, and are also enjoying an adult beverage out back, and Ted looks down the canal at all of the boats and thinks to himself, a boat might be fun. He mentions this to Alice, who says, "But Ted, you don't know anything about boats." Ted says, "you're right, but why don't we look into it." The next week Bob and Carol, having decided they are going to buy a boat, start to discuss what kind of boat they want. Bob wants it to be fast and sleek, with lots of colors, and a refrigerator for the adult beverage mixers, and ice. Carol wants one that is big and comfortable, with a bathroom, square bed, leather furniture, and air-conditioning. So with all the important boating criteria having been decided on, off to the boat show they go. Ted and Alice spend some time talking with friends about boating, and decide to join a local boat rental club. 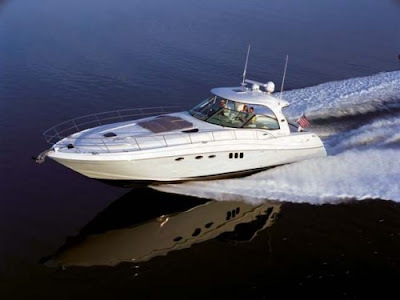 They try many different types of craft to see if they really like boating enough to make an investment, and they also take together several Power Squadron boating courses. 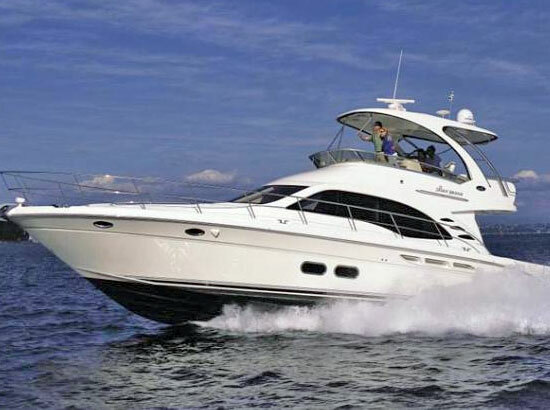 Bob and Carol go to the boat show, and after an hour of extensive research at the boat show, and much to the dealer's delight, they purchase the new 2010 Magnifico 50' cruiser. It has everything they want. A bar, lots of leather furniture, two huge 1000 hp diesel engines, a 40" plasma TV, and just imagine, they can even watch TV on the chartplotter thing while driving. Won't the neighbors be envious. Ted and Alice are enjoying boating, but are still a little unsure about what they want. They have two small children, and need some room, but they don't want to start with something large right off the bat. They opt to buy a 26' foot cruiser. It has all of the basics to weekend on. They have a decent chartplotter installed, double check that they have good safety gear, and off they go. Bob and Carol take delivery of the boat, and the dealer has a captain give them an orientation. There is a big package of manuals for the boat, that Bob stows under the settee, because Carol doesn't want that stuff laying around, and off go Bob and Carol. Bob is a little fuzzy on the concepts involved with the red and green signs that are stuck out in water, and he can't quite figure out that map thingy on the console. Even worse he can't find out how to turn on that nice lady's voice that tells him when, and where to turn. In less than twenty minutes, he is on a sandbar, with props that now look like tulips. Much to his chagrin, the vessel is hauled back to the dealer, and new props are installed complements of his Visa card. Ted and Alice love boating, and use the little 26 footer at every opportunity. It leaves the dock stuffed with water toys, kids, fishing poles, and provides much pleasure. What was once awkward boat handling, is now graceful and competent. Bob and Carol still have the boat, and it is now for sale. Bob hires a captain to take them out occasionally on nice days, (Carol gets sea sick easily) and it takes more effort to maintain, than he wants to put into it. They do use the barbecue on board, and the grandchildren love to sleep on it when they are in town. Ted and Alice used the 26 footer for a year, and traded it in on a 34 footer. The new boat has more room for the kids, their stuff, and the adults. It is used often. They are now thinking of getting something larger, and maybe with sails. 1. The bigger the boat, the less it leaves the dock. If it gets big enough, it will never leave the dock. 2. The more people watching you dock from the marina bar, the worse you will do. 3. Only amateurs have new looking boat shoes. 4. Always have paper charts on board. A blown fifty cent fuse renders all your expensive electronics useless. 5. A place mat from a seafood restaurant is not a chart, ever, and even if it looks like a chart, it's not! 7. If anyone tells you they don't need a chartplotter, because they know these waters like the back of their hand, hang on to something solid. 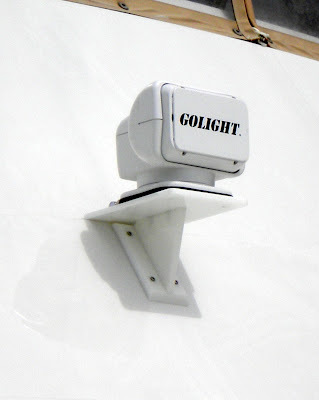 A little while back, the angry wrathful sea gods threw a lighting bolt at the Sarasota County fire boat, and wrought severe damage to the electronics, including the Raymarine radar, C-80, and Raystar 125 GPS. Verado electronics, radio's, and many other items were also barbecued well done in the incident. All of the Raymarine's data was lost when it meet the evil half cousin of Ready Kilowatt. The fire boat is a sturdy Boston Whaler on steroids, made by Brunswick's government division, and does not draw a lot of water, making it a good choice for Sarasota's "thin waters". This bring us to the story of how important "Tracks" on your GPS can be for all boaters. The fire boat had to do a night run recently, to check out a report of flares seen in the Gulf. This was not a pleasant night to be out. The weather was cold, winds were high and the Gulf was unsettled. The boat went made it out of New Pass okay, but the approach back was more difficult, especially at night. They got in safely, but they went over part of the bar with a little more than few feet of water under them. Captain Greg Garrison (left below, Mitch Thorne to the right) decided this would be a good time to do some retraining on the electronics, and especially in using tracks. Not to belabor the point, but using, and making "Tracks" with your chartplotter is one of the most valuable things you can learn how to do, and one of the very first things I teach boaters how to do on their nav systems. The passes in our area are poorly marked, rarely maintained, shift constantly, and have eaten many a prop. So having a good safe "Track" through them is very important. The training session on the fire boat this day, was on how to make tracks, save tracks, name tracks, and use tracks. Since we were using the Raymarine C-80, I will use C-80's approach to this, but Garmin's and Furuno's operations are very similar. The general approach to doing a good track through the a pass, is to pick a nice calm day, with good water visibility, preferably at low tide if possible. Always start on the land side, and do this going out the pass. I also like to use a split screen with sounder on one side, and chart on the other. It can be useful to see the bottom depth trending up or down while you do this. Start in safe water, and on the Raymarine, press "Navigation Options", then "Tracks", and then "Start Track". Don't see "Start Track"?, just press "Stop Track", discard the active track, and then press "Start Track". Now slowly go out the pass using the deepest safe water path you can find. Be careful to give markers, and the ilk as wide of a berth as possible, so it is more difficult to hit them on a dark and stormy night. Make the course out as straight, and clean as possible. I like to go out about a quarter mile out into the Gulf to insure I can safely approach the track from any angle coming in with no obstacles. You then stop the track, save the track, and name the track. I also make a waypoint near the start of the track to "Goto" to locate the track. You can see above the waypoint, and the bow of the vessel pointed at the track. Once you have your track nailed down, you have the option to covert it to a route that you autopilot can follow. Remember when I said try to keep the track as straight and clean as possible? When you convert the track to a route, the chartplotter has to take the curvy track you made, and convert it to a bunch of straight line segments that closely fit your track. The more curvaceous your path is, the more waypoints it takes to convert it to a route, so steer small damn your eyes. With Mitch at the helm being ever vigilant, a good track was laid down, and the fire boat has a good path in. Next job kids, is to do the other passes, and save off the info onto a chip, so the angry wrathful sea gods can't get your data again. This inline fuse is not a good piece of work, and I cut out two of them on boats this week. Both were attached to sounder module power cords. In both cases, the sounder modules would not power up. Here is the problem. The metal contacts attached to the the wire are very small stamped tabs that are bent over. Over time, due to spring pressure, or other mysterious, and unknown cosmic forces, the tabs end up being bent over slightly past ninety degrees, reducing what little contact area they have to nearly nil. You can see in the picture (click it for a better view), the lower contact is bent at an angle, leaving only the edge for a contact surface. The less contact area there is, the harder it is to get Mr. Electricity through the system, but I know I don't need to tell the experts that. On devices that require real power, like a sounder module, this problem is exacerbated. I have had problems with this fuse holder on lower power devices also. Through the years my wire cutters have been used to change out many of these devices, and I replaced them with a better quality fuse holder. Come on boy and girls, you can find a better inline fuse than this one.